If you're planning on going whale watching in the northern part of California, from Marin County to the Oregon border, this guide includes all the best places to go, when to go, and how to see some of the world's biggest creatures as they swim just off the California coast. Whale watching season in Northern California starts earlier and ends later than it does further south. 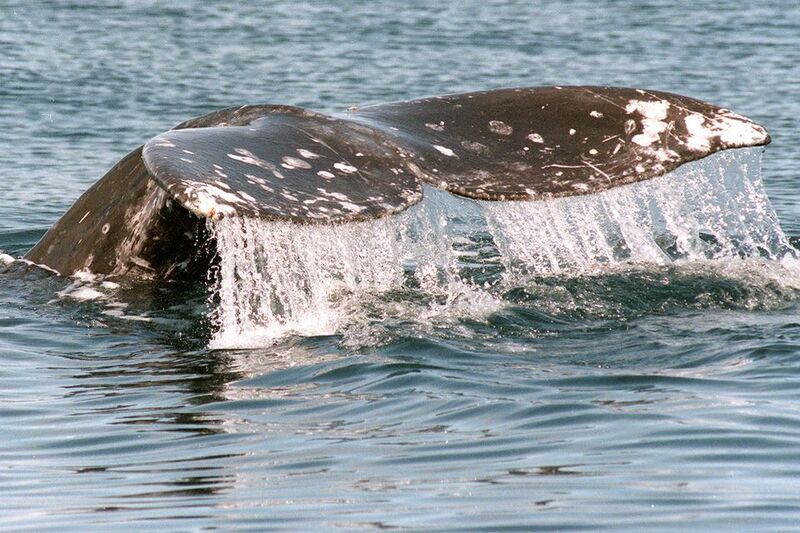 Migrating gray whales are the species seen most often in Northern California. Their migration starts in the Arctic Ocean and ends 10,000 to 12,000 miles south off the coast of Mexico. They pass the Northern California coast from December through February, and they're northward-bound from March through May. Killer whales (orcas) are also spotted once in a while along the Northern California Coast. If you want to know more about the animals you can see, check the guide to whales and dolphins of the California Coast. You won't find as many whale-watching companies along the northern coast as in other parts of the state, but there are a few. Bodega Charters operates whale watching cruises around Bodega Bay from January through the end of April. If you want to see the whales from the water in Mendocino, several companies operate seasonal trips. The best places for whale watching from land in northern California are the spots where the land juts out into the ocean. Any place with the word "point" in its name is a good candidate. Point Reyes: The Point Reyes Peninsula extends into 10 miles into the ocean, and the whales' migration route passes close to land, making it a great spot to view gray whales. The best viewing times are January and March. In fact, it gets so busy at Point Reyes that time of year that between January 1 and April, the park runs a weekend shuttle bus from the Drakes Beach parking lot. Bodega Bay: Try Bodega Head Park near the town of Bodega Bay, where the high cliffs provide a good place to scan the ocean for the whales, looking for their spouts and flukes. Bodega Head is part of the Sonoma Coast State Park. Volunteers from the non-profit Stewards of the Coast and Redwoods are in the park as interpreters are available from January through Mother's Day to help visitors get the most out of their whale-watching experience. Near Jenner: Fort Ross State Park and Salt Point State Park are often mentioned as whale watching spots along this stretch of coast. Mendocino: Point Arena and Point Cabrillo are excellent places to try to see whales near Mendocino - and they both have historic lighthouses to visit, too. Several Mendocino County towns also have annual whale festivals. Humboldt County: Best whale viewing in Humboldt County is September through January and March through June. Any of the high cliffs that overlook the ocean are potential watching spots, especially Trinidad Head at Trinidad State Beach and the community of Shelter Cove on the Lost Coast. If your definition of northern California includes places south of what this guide covers, try the San Francisco and Half Moon Bay whale watching guide. Even further south, you can go whale watching in Monterey and Santa Cruz.